The speed of the cars rolling down from the hump into the fan area must be regulated based on various factors. Information such as whether the cars are full or empty, heavy or light freight, and varying number of axles determines individual speed conditions. It is also important to know the number of cars already on the classification tracks, and varying weather conditions, including temperature, wind speed and direction. Variable speed and fixed speed Gardner Denver air compressors installed at the Alton & Southern Railway in St. Louis. Concerning speed regulation, this work is done by mechanized "rail brakes," called retarders. Their job is to brake the cars by gripping the wheels. They are operated either pneumatically or hydraulically, with Alton & Southern Railway’s system using the former. Considering much of Alton & Southern Railway’s compressed air piping system dated back to its 1960’s installation date, there were leaks. As of 2012, it was determined one and a half compressors were running at 100% capacity just to maintain leaks. This equated to about 1,500 cfm at a cost of roughly $180,000 in electricity annually. The new compressed air piping system being cutover to the retarders at Alton & Southern Railway. Alton & Southern Railway’s journey towards optimizing the compressed air system took roughly 10 years, beginning back in 2004 when the low air alarm began firing consistently. Their equipment at the time consisted of three 250-horsepower, 1100 cfm compressors, running full load with the low air alarm still persisting. This is when they brought in Jim Timmersman, the lead compressed air auditor from Power Supply Industries, to troubleshoot the system. Timmersman worked with Alton & Southern Railway’s budgeting constraints over the years implementing changes along the way. Timmersman focused on their compressed air dryers, flow controllers, piping, storage, and finally their air compressors. A major factor for the infrastructure’s inefficiency was the introduction of compressed air dryers had not taken place for several years during the rail yard’s operation. Much of the compressed air piping developed major erosion issues due to improper dew point conditions. Heatless dryers were eventually installed, though poorly maintained. This caused a 15 psi pressure drop and continued unstable dew point conditions. They were replaced with heated purge desiccant dryers providing a dewpoint of -40 °F. This merely scraped the surface when it came to tackling the entire project. This all played into the major process of lowering the plant pressure from 140 psi, to the optimum operating point being between 90 – 100 pounds. The new heated purge desiccant dryers located inside the air compressor building. The next project Timmersman brought to the table was the introduction of a compressed air flow controller. Flow controllers adjust to system changes instantaneously. They can allow air compressors to accelerate and catch up to air demand, while maximizing the advantage of the available part load performance. They can also prevent pressure degradation if an operating compressor fails, and may eliminate compressed air related work stoppages and production interruptions. Ultimately, the plant pressure was reduced from 140 psi to 105 psi, where the air compressor’s output was reduced from 140 psi to 128 psi. This allowed the high-pressure machines to continue operating at a high pressure to build storage, yet allow the plant to work on the lower pressure. This also effectively reduced the low-air alarm threshold to 88 psi, allowing at least one compressor to shut off most of the time. Scott Bertelsmeyer, Jim Timmersman and Adam French at the Fenton, Missouri, headquarters of Power Supply Industries. Compressed Air Best Practices® Magazine sat down with Scott Bertelsmeyer, Adam French and Jim Timmersman from Power Supply Industries (PSI). Good afternoon. Nice to hear from you! How is your business and what is driving your growth? As you know, our business is doing well. We now have roughly 50 employees based in three locations; our headquarters here in Fenton (St. Louis), Missouri, and the Illinois branches in Decatur and Peoria. The growth of PSI has come due to our successful business strategy shift, which started 16 years ago, to make energy conservation in compressed air systems, the focal point of our business model. Quality and reliability are now a given. Our clients have increased the importance of energy management within their companies, and we meet the expectations of Energy Managers interested in “system-buying” and leveraging utility incentive programs. How has PSI changed in order to excel at meeting the demands of Energy Managers? PSI was founded in 1983 on the premise, we still maintain today, of being a full-service air compressor sales and service company. What has changed has been what our clients define as “full-service.” PSI has always excelled at being the company you could trust to service and maintain compressed air equipment, and re-build it if necessary. We have always represented and installed the highest quality compressed air system equipment. Reflecting what the market demanded, in those earlier years we were very supply-side oriented. 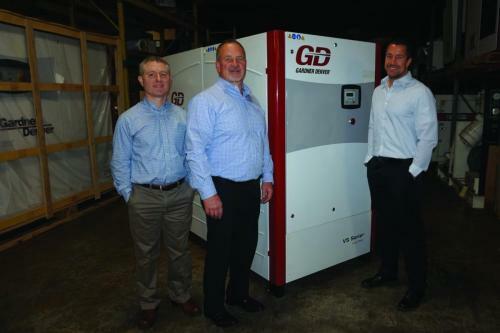 During site visits, we spoke to clients about the features and benefits of our Gardner Denver air compressors and dryers - in the compressor room. Our clients wanted us to focus on the reliability and purity of their compressed air systems. This is what we did. When we decided to truly focus on energy conservation, we started by investing in the technical training of our staff. We had to shift our focus outside the compressor room, learn to optimize the demand-side of the compressed air system, and then know how to implement best practices in controlling compressed air flow and air compressor sequencing. Isn’t optimizing the demand-side of the compressed air system easy-just fix some leaks?! Good one. As you know, fixing a few compressed air leaks can actually increase the leak rate in a plant, as air will simply escape faster (at higher pressure) from the remaining leaks! We started as always, with our staff, and hired expert auditors like Jim Timmersman, who launched the PSI Energy Services Group. His team developed formal leak management programs, for example, annual programs designed to receive utility incentive funding and “maintain the gain” in a factory. We had to develop knowledge of inappropriate uses of compressed air and how to manage them. If a plant is using vacuum generators, for a “pick and place” application, can we optimize this? This led us to our investment in Process Air Solutions. Why did PSI invest in Process Air Solutions? It was a natural consequence of our decision to focus on energy conservation. Once we made that shift outside the compressor room, we were constantly faced with situations on the factory floor requiring low-pressure air. How should this factory produce low-pressure air at high volumes to blow-off breadcrumbs or metal shavings? How should this printer keep the sheets from sticking together? Is this bottler using the right nozzles to dry the moisture off the bottles? If regulating 100-psi compressed air doesn’t make sense for a 15-psig application, what kind of blower should they use? How much do we know about blowers? Ed Ball and Greg Cannon manage Process Air Solutions as a separate business and can expertly answer all these questions and more. They focus on applications ranging from 50 psi all the way down to vacuum. We have become a market leader in low-pressure air knife blow-off systems. They advise leading corporations on how to apply their Vortron centrifugal blowers and air knives to their low-pressure processes. As a result of their audits and implementations, the blower and air compressor horsepower they turn off are astounding, and frankly exciting. Many of their implementations yield results where 1/10th the horsepower is now being used. What role have utility incentives played? The role of our local Utility Energy Programs has been significant. The rebates have motivated factories to focus on energy conservation when many wouldn’t have before. The custom incentive programs may provide 30% to 50% rebates off of the total project cost, making the ROI’s on energy conservation projects, like compressed air, very attractive. The retro commissioning programs from the local utilities are also very effective because they will defray typically 50% to 80% of the costs of an energy efficiency study. This removes the risk and obstacles to conduct a much-needed system assessment in a factory. Without the study, projects don’t get done. Power Supply Industries has been intensely involved, as a Program Ally, since the utility program was started. We were named their over-all “Business Program Ally of the Year” every year from 2008 to 2017, because we executed so many energy conservation projects receiving rebates with our customers. It’s been and continues to be an excellent program. What are some lessons learned as a result of this journey towards energy conservation? We’ve become very conscious of the difficulties factories have filtering real from fictional energy conservation opportunities. This is why trust remains the biggest asset we build over time with our clients. Today, our clients are bombarded with the message saying reduce compressed air demand out in the plant, and you will automatically see equivalent energy savings. There are a lot of companies talking “install this and you will see up to 50% energy savings.” We constantly remind our clients that plants don’t save energy unless the air compressors use less energy – and demand-side savings only translate if the air compressor and pressure/flow controls allow it. The biggest cultural and behavioral change came when we committed to visiting the plant enough to understand how they use compressed air. We may visit a client eleven times now before we receive a purchase order. We are conducting a walk-through, taking measurements, conducting a system audit of the demand-side and then presenting the survey. This is about doing more business with your existing clients in a win/win manner. We are now working on their entire piping system, and doing projects once a year to incrementally improve their system. Thank you for your time today and congratulations on the growth. For more information on Power Supply Industries, please visit www.psiind.com. By 2007, all three air compressors were back to 100% capacity load, the low air alarm began flashing again and a fourth “portable” compressor was purchased and tied into the system as needed. The piping was merely too old and the leaks far beyond repair. Timmersman noted, “An entirely new piping system was required to fix the problem.” Ameren Missouri was contacted whose utility incentive program, Act On Energy, is designed to help pay for upgrades, if certain energy consumption reductions were met. The rebate amount was $178,000, if completed in 2007. This was not in Alton & Southern Railway’s budget. By 2012, it was determined one and a half compressors were running just to maintain leaks. With the current demand profile of 3,000 cfm, 1,500 cfm was being wasted due to the issue. Alton & Southern Railway decided it was time to pull the trigger. The first step was to design the new layout of the piping. The initial header was a gradual reduction from 6 inches, to 4 inches, to 2 inches. This was replaced with a 6-inch header with 4 and 2-inch lines branching off of it for the required application. The implementation of the new header alone would mean a gain of 6,000 gallons just in piping. Second, was the strategic placement of compressed air storage. A new air building was constructed, housing a 20,000-gallon storage tank; while the old air building still housed 11,000 gallons worth of storage. Secondary storage comprised of two 5,000-gallon tanks. One 5,000-gallon storage unit was planted at the top of the hump yard closest to the master retarders where demand is the greatest. The second 5,000-gallon tank was located in the lower field known as the “fan,” where the rail lines separated into multiple tracks. This is where secondary retarders are located, acting as a failsafe for controlling the car speed if the main retarder were to fail. One 5,000-gallon compressed air tank located at the top of the hump yard where demand from the retarders is greatest. Control demand events (peak demand periods) in the system by reducing both the amount of pressure drop and the rate of decay. For some systems, it is important to control the rate of compressed air flowing to refill a secondary receiver (the control is called metered recovery). If the rate is not controlled, filling the receiver will become a demand event, potentially causing system problems due to a high rate of flow. A total of 7,000 feet of piping was installed, equating to over a mile’s worth of infrastructure. Many parts of the original piping line were entirely inaccessible due to it being underground. Not only did much of the original line need to be dug up, but also the new line needed to be implemented in such a fashion to allow for better access for routine maintenance. A series of trenches were developed with access points running the entire length of the system, as to diagnose any future complications. With the construction and installation complete, and the old line unearthed and ready to be dismantled, there was minimal delay in cutover to the new system. This was paramount in order to keep the hump yard in operation. The Gardner Denver VS235 was installed as the new trim air compressor, with two fixed speed 300 horsepower Gardner Denver’s running as the baseline machines, tied together with the sequencer. With storage totaling a whopping 47,000 gallons and leak free piping, the demand profile dropped from 3,000 cfm to 1,200 cfm. The VSD air compressor handles the intermittent demand, from the retarders, very efficiently. Timmersman stated, “The VSD was chosen specifically because the retarders can go a half hour with no cars coming down the hill, then spike with the demand event of trains coming with over a 100 cars.” Thus, the VSD reduces artificial demand when little to no compressed air is needed. Variable speed compressors can efficiently and reliably handle the varying air demand found in most plant air systems. These compressors speed up and slow down to match air supply to air demand as it fluctuates. The right variable speed compressor in the right application delivers significant energy savings and a stable, consistent air supply. With an initial demand profile of 3,000 cfm at 140 psi, where 1,500 cfm was going toward compressed air leaks in the piping underground, they now have an average flow of 1,200 cfm at 105 psi due to the changes to the piping, drying and storage systems. The three original 250-horsepower, 1,100 cfm, fixed-speed air compressors ran continuously and were supplemented by an additional portable 300 hp electric air compressor. They were replaced by two fixed speed 300 hp and one Gardner Denver VS235 air compressor. The VS235 supplies compressed air, when needed, to the rail yard’s inconsistent demand events. The benefits are plentiful. By eliminating the wasteful compressed air leaks and reconfiguring the entire system, Alton & Southern Railway saved a total of $182,748 in annual electricity costs. Ameren Missouri provided a significant utility incentive rebate of $234,971, making the ROI on the project attractive. Ultimately, the installation provides newer, more reliable air compressors, brand new piping infrastructure and an easily accessible system for easy maintenance reducing routine costs across the board. You don’t need any train-ing to see these benefits. For more information contact Jim Timmersman, Lead Compressed Air Auditor, Power Supply Industries, email: jim.timmersman@psiind.com or visit www.psiind.com. To read similar articles on Compressed Air Piping and Storage, please visit www.airbestpractices.com/system-assessments/piping-storage.